Rather than waiting to get home to use the computer, the app MoPho allows you to create print products all on the iPhone. Using photos you have taken with your iPhone, the app offers a long list of items that can have your photos printed on. Choose a product, select one of your photos (you can pull photos from Instagram too), adjust the photo on the product, pay and MoPho service will print and ship the item for you. Great fun but also a life saver when you forget to send a gift to someone or need to have something for a special event like a company co-worker going away get together. 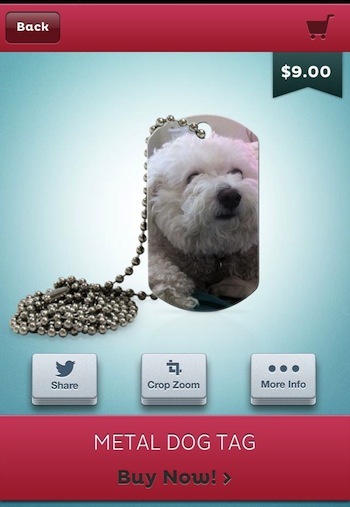 In the latest update, the MoPho app has received the addition to it’s product list… a Dog Tag.